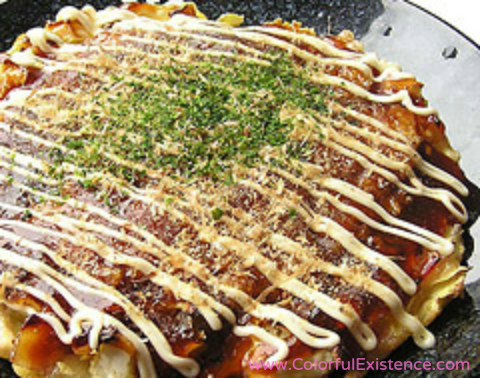 Okonomiyaki – Japanese savory pancakes; is a dish made by mixing ingredients like finely sliced squid, shrimp, pork, beef, and cabbage into a batter made from flour & grilling on a flat iron grill. The name Okonomiyaki comes from the Japanese phrase “okonomi de yaku”, meaning grill the ingredients you like in the way that you like. Many places let customers grill their own Okonomiyaki on large flat iron grills set on top of the table. It is a lot of fun to grill up your own Okonomiyaki with a group of friends or family. Okonomiyaki styles are generally categorized in two styles: the “Kansai style” from Osaka and the “Hiroshima style” out of Hiroshima. 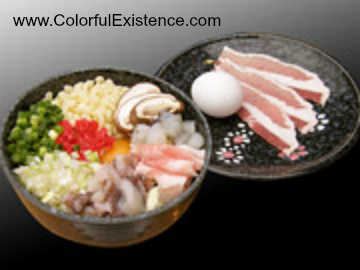 For the Kansai style, the flour batter is poured into a bowl along with all of the other ingredients, mixed together, and then poured onto the iron grill. While grilling, spread the batter to form circular shapes…like pancakes. When shaping the batter, if you slap it repeatedly with the utensil provided, called a “Kote” (an Okonomiyaki spatula) to expand it, you won’t get a fluffy texture. After one side is grilled, turn it over with the Kote and grill the other side. After both sides are done, spread on lots of sauce, sprinkle on Aonori, also known as “laver” in English; to taste, and cut nice sized pieces with the Kote. Most often, mayonnaise would be added to finish off. In the Kansai region, eating piping hot pieces straight off the grill with the Kote instead of using chopsticks is considered the style for a true connoisseur. Give this method a try! Just make sure you’re careful not to burn your mouth. The Hiroshima style, on the other hand, is to layer the ingredients and batter onto the flat iron grill WITHOUT mixing them first. Because this style requires some technique, many shops have the staff grill the Okonomiyaki instead of the customers. With eggs and soba – buckwheat noodles; added, the portions are satisfyingly big. For the Hiroshima style, first cabbage and pork are layered on top of the batter that has been spread out to a round shape on the iron grill. This is flipped with the spatula and simmered. Chuka soba noodles or Udon noodles are fried on the side and then placed on the grilling Okonomiyaki. Next, an egg is cracked, and after gently breaking the yolk and grilling, placed on the Okonomiyaki to grill further. 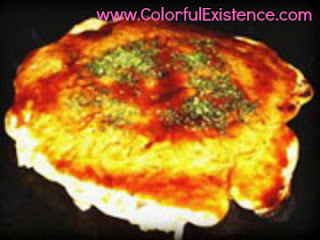 Then, sauce is spread on with a brush after the Okonomiyaki is finished grilling, and Aonori is sprinkled on lavishly. The Tokyo style Okonomiyaki is similar to the Kansai style in that all of the ingredients are mixed BEFORE grilling on the iron grill. However, in the Tokyo style, soup stock – Dashi, is mixed into the batter. Also, chopsticks are used to eat instead of the Kote spatula. Also, when cutting – the pieces are usually cut into cubes in Kansai, but it is common to cut triangle slices like a pizza in Tokyo. 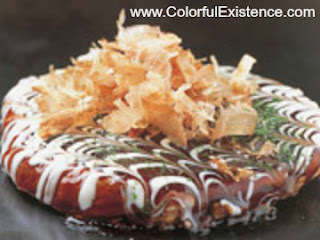 The Tokyo style Okonomiyaki is also known as: Monjayaki. Okonomiyaki is so yummy! Had no idea there were so many different kinds tho! Okonomiyaki is definitely one of my favorite foods! I especially enjoy the Kansai variation. Guess what!! I love experimenting and creating different versions too! In Spain we’ve a okonomiyaki speciallity restaurant but I’ve tried the original versions in Japan. You know, Japanese food isn’t the same in Spain as Spanish food from Spanish restaurants isn’t the same in Japan. I like Spanish food too and have tried some Spanish restaurants in Tokyo. There’s definitely a Japanese feel to it, so I understand what you meant. So far, where in Japan have you been to? Okonomiyaki is one of my favorite foods to make!